You will definitely want pliers for this project. I ended up using Steve's Leatherman for the job. 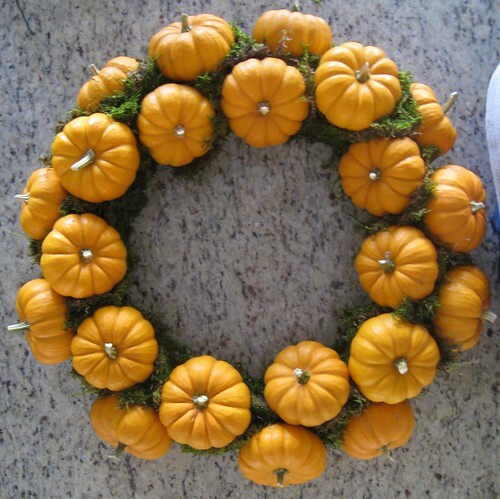 As promised, I finished working on my Halloween DIY Pumpkin Wreath over the weekend and boy am I glad it's done! Don't get me wrong, it looks fantastic, better than I had expected. But it was a lot harder than I had anticipated. It's a great DIY project to work on, but I have a few disclaimers before you get started. First off, let me be honest. This project was not cheap. In total, it cost me $54. Let me break it down a bit for you. 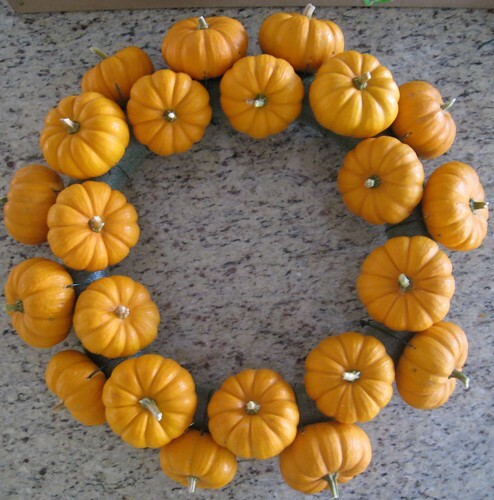 The little pumpkins alone cost $0.99 each and I needed 24 to create the wreath, so there's $24 spent right there. Then the cost of the plastic foam wreath, florist pins, florist wire, and sheet moss totaled to $30. Thankfully I had a metal skewer (from the grill) so I used that instead of buying a nail/ice pick to puncture the mini pumpkins. 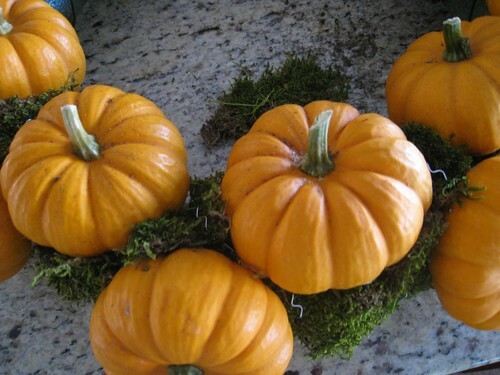 I know that $54 isn't a ghastly amount to spend on seasonal decorations, especially if you can use them every year. 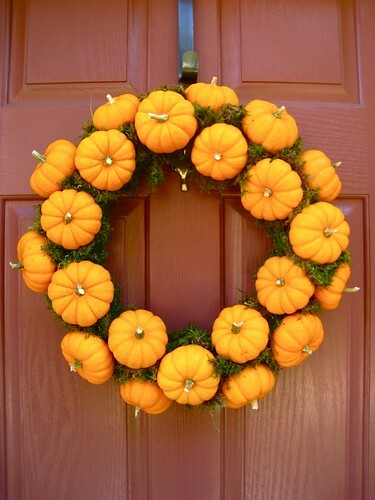 But because this wreath uses fresh pumpkins, it will only last til the end of Halloween this year, which makes it seem a bit pricey for a one-time use kind of thing. Overall though, this is a great DIY project since the final product is a one-of-a-kind wreath (haven't seen anything like this anywhere yet). 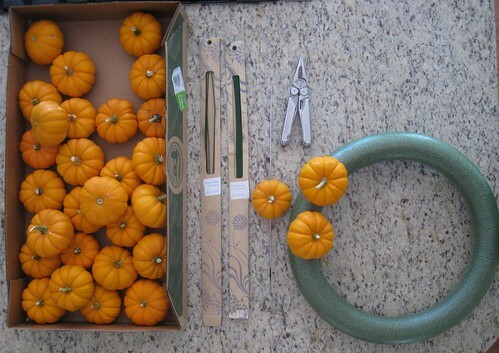 First, you will want to use your metal skewers or nail/ice pick to puncture a hole from one side of the pumpkin to the other (parallel to the bottom on the base of the pumpkin). 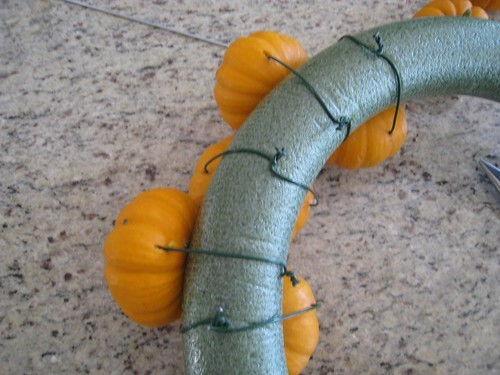 This will allow for you to thread your florist wire (I used a 18" long @ 16 gauge wire) through the hole so you can wrap the pumpkin around the plastic foam wreath (see above image). 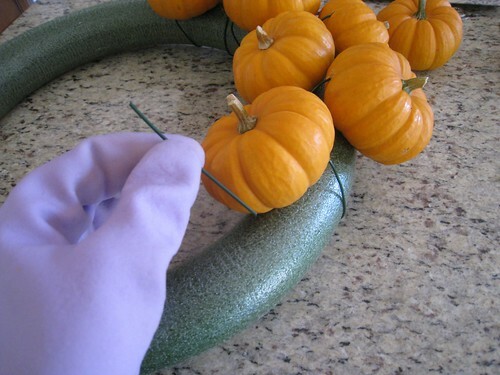 After you've wrapped your pumpkin tightly around the wreath, trim the excess florist wire and puncture it through the pumpkin into the wreath so that the pumpkin is securely attached to the wreath. Yes, I wore dishwashing gloves to give me a better grip on the pumpkins. Took me about 45mins-1hr to get this far but I had the radio blasting so time flew. I'm at the 2 hour mark at this point and I'm feeling good since the wreath is really starting to take shape. I will say this though, my finger tips are hurting at this point. Yay! 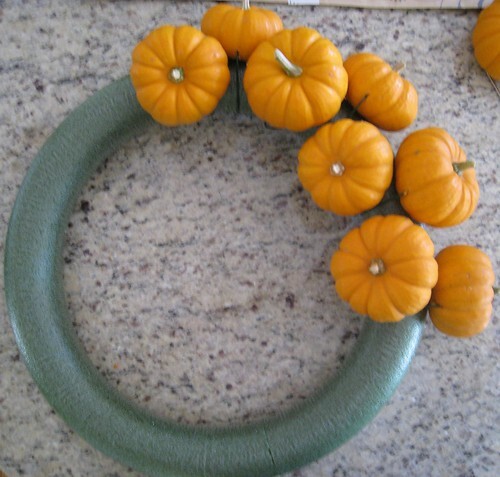 The pumpkin part of the wreath is complete. I can start adding the sheet moss to the exposed areas of the wreath. 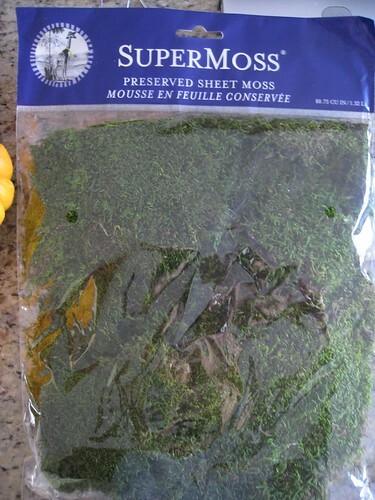 There were several kinds of moss to choose from at Michaels, but I chose this one because of the vibrant green color. I used the florist pins to secure the moss to the wreath. Yes, you will be able to see the florist pins once you've secured the moss, but I tried to cover it up by moving the moss over it a little bit. Tada! I used some thicker florist wire to secure it to the hook on our front door. The front door area is almost complete with our Halloween decorations. I'll be working on another DIY project to finish it all up, but more on that later! What do you guys think? It's adorable and looks nice and simple, yet festive. 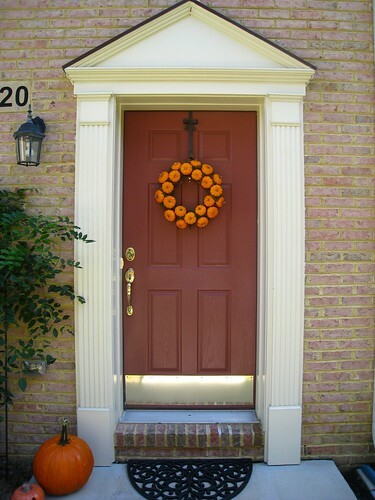 Your front door wreath turned out great! Looks perfect for the season! 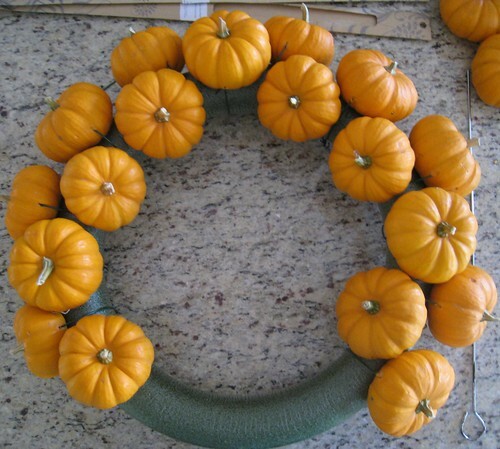 Wow, amazing and interesting post, really unique to use pumpkin and making pumpkin wreath.Thanks for your step by step tutorial for making pumpkin wreath.